To understand the challenges slowing the uptake of what appears to be a win-win response to climate change and food insecurity, a team from Integra, an international development consulting and project management firm, worked with Clark University to produce a report on the factors shaping CSA adoption in sub-Saharan Africa for the U.S. Agency for International Development. Researchers conducted a systematic literature review of nearly 500 documents, interviewed more than 40 technical experts with diverse backgrounds, and performed in-country surveys of more than 200 farmers in Burkina Faso and Kenya. The study shines a light on the conflicting narratives surrounding CSA adoption and reveals a distinct gap between CSA’s theoretical applications and the day-to-day reality of its target audience. 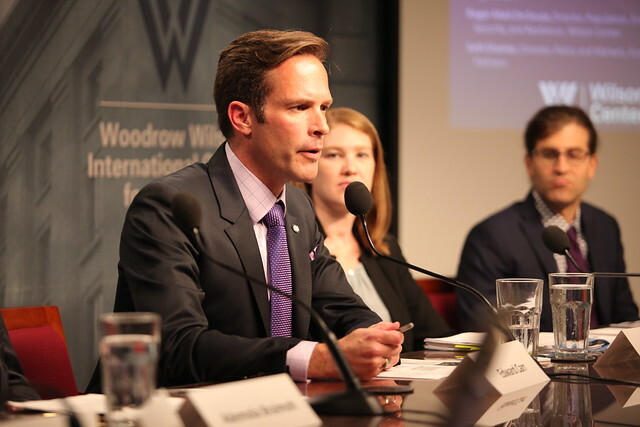 The Wilson Center invited a panel of experts to discuss the implications of the report and thoughts on how these challenges might be surmounted. While it quickly became apparent that there is no easy answer to improving CSA adoption, the discussion highlighted key considerations moving forward, namely, the need for iterative learning and a greater consideration of the various contexts in which agriculture is embedded. Is There Such Thing as “Climate-Dumb” Agriculture? “CSA is a conceptual framework; it is not just a set of tools,” said Edward Carr, a senior advisor to the project and professor of international development, community, and environment at Clark University. With its aim of providing substantial benefits to farmers despite climate threats, the idea has risen as a key development goal for many governments and donors. The benefits of CSA include increased productivity, income, risk management, and resilience to climate change. The dominant narrative around CSA suggests that success depends on the promotion of specific technologies to farmers and providing training on how to use them. But as Carr noted, “there isn’t a lot of climate-dumb agriculture,” particularly not in the places traditionally targeted for CSA, like sub-Saharan Africa. Smallholder farmers in these regions must routinely overcome hurdles such as variable climate conditions, poor market access, weak infrastructure, and lack of information. “If they were bad at this, they would be dead,” Carr said. Much of the discourse surrounding CSA perpetuates the assumption that people are motivated by the same things regardless of context, said Carr, and places an undue emphasis on technical factors without also considering behavior. Factors such as the wider social, political, and institutional environment can have significant effects on the success or failures of agricultural strategies. Carr noted how problematic it is to overlook social and cultural values and norms in thinking about the reasons farmers use certain techniques or technologies. He explained that particular farming practices are not easily extracted from their social contexts. How farmers farm is part of their culture in many places. In some Bambara-speaking communities of southern Mali, for example, Carr pointed to how millet farming is tied to masculinity. “Men farm millet and that is one of the definitions of a man,” he said. “If you don’t do that, you actually kind of fail to fit that social category.” Researchers found that men who earned substantial income from professions other than farming still maintained millet fields on the side for this reason. A CSA program that inadvertently challenges ideas like these by encouraging the switch to cash cropping or growing something else may fall on deaf ears. “You are not going to radically reshape social norms through CSA,” Carr said. The study found that interventions that theoretically improve long-term viability were likely to see little uptake, regardless of the eventual benefits. “Why would they take that on? That’s not climate-smart to them,” Carr said. CSA incentives need to be “relevant to the level of decision-making that farmers use,” Braimoh said, including their decision-making timeframes and perspectives on risk. The report found the barriers and incentives to CSA adoption vary significantly from place to place, suggesting there is little that is universally applicable to all farmers. This is an argument for assessing priorities on a case-by-case basis, Carr said, rather than assuming that motivations and contexts are the same across the board. Caitlin Corner-Dolloff, the CSA program manager at the U.S. Department of Agriculture, said she has found the CSA approaches that have the most impact in terms of improving climate resilience (e.g., intensive dairy production in conjunction with biodigestors) tend to have the lowest adoption rates, primarily because of initial high costs. She advocated for an iterative learning process and improving information flows across local, national, regional, and global levels to better understand the priorities of farmers and the challenges they face when transitioning to CSA. Corner-Dollof also suggested that the introduction of multiple CSA approaches might be more effective than providing a singular path for farmers. This would allow them to pick and choose what works for them and their communities and provide more opportunities for uptake. Seth Shames, director of policy and markets at EcoAgriculture Partners, said it was important for advocates of CSA to be aware of the entry points for their interventions. Will the proposed solutions solve the farmers’ problems? What are those problems and who defined them? Sources: Food and Agriculture Organization of the United Nations, International Center for Tropical Agriculture. 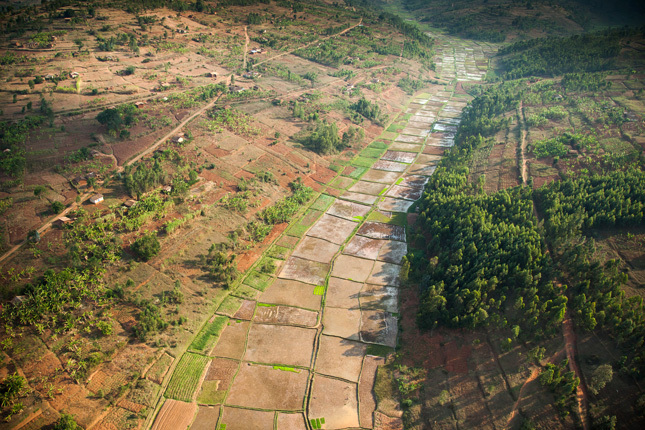 Photo Credit: Rice paddies in Rwanda, courtesy of A’Melody Lee/World Bank. What is the name of the report referenced in this article and has it been published yet?